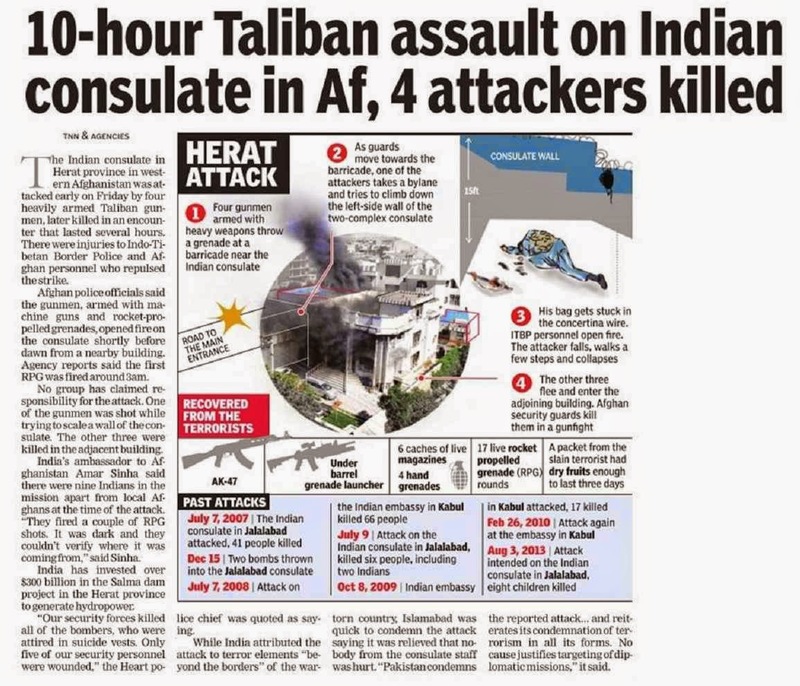 Gunmen armed with machine guns and rocket-propelled grenades attacked the Indian Consulate at Herat in Afghanistan early this morning, barely three days before the BJP-led NDA government formally assumes office in Delhi. The Indian diplomatic staff escaped unharmed, while all four attackers were killed. The attack is believed to be the handiwork of elements operating from Pakistan. Gunmen opened fire around 3.15 am on the consulate from a nearby home, Herat provincial police chief Abdul Sami Qatra was quoted as saying. No group has claimed responsibility for the attack that was repulsed by India's Indo-Tibetan Border Police personnel and Afghan security forces. One attacker was killed while climbing the wall to enter the premises of the consulate that also houses the residence of the Consul General, said Indian Ambassador to Afghanistan Amar Sinha. Foreign Ministry spokesperson Syed Akbaruddin was guarded in his response to questions from the media on the attack. “We strongly condemn this cowardly attack. It again underscores that the main threat to Afghanistan and its peace, stability and security stems from terrorism beyond its borders,” he said. Herat lies near Afghanistan's border with Iran and is considered one of the safer cities in the country. The Indian Consulate there focuses on some development projects, including the Salma Dam hydropower project. 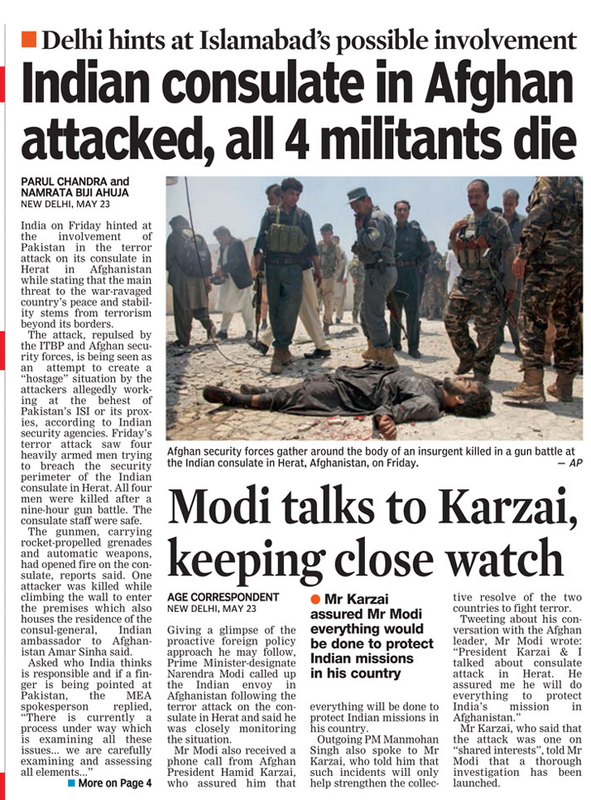 Prime Minister-elect Narendra Modi spoke to Afghan President Hamid Karzai and Indian Ambassador to Afghanistan Amar Sinha to discuss the situation arising from the attack. During the 10-minute conversation with Karzai, he told the Afghan leader attacks of this nature would not dilute India’s commitment to assist the people of Afghanistan. 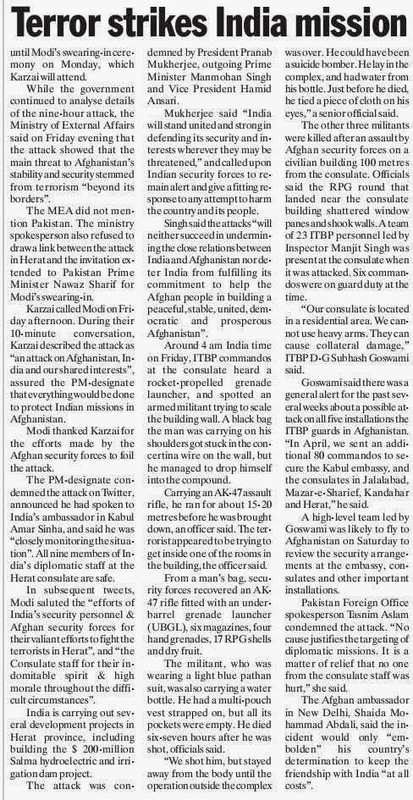 On his part, Karzai promised Modi he would do everything to protect Indian missions in his country. 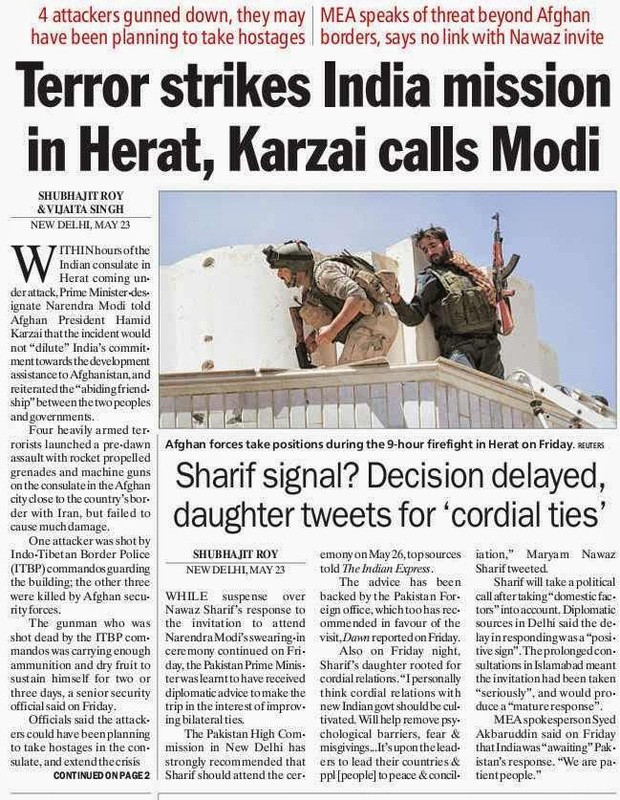 “India salutes the efforts of India’s security personnel and Afghan security forces for their valiant efforts to fight terrorists in Herat,” Modi tweeted later. This is not the first time that terrorists have attacked an Indian mission in the war-ravaged nation, where India has invested more than $2 billion in development works, including roads and power projects. Last August, an assault on the Indian consulate in the eastern city of Jalalabad killed at least nine persons. Earlier this year, a suicide bomber was gunned down near the consulate in the southern city of Kandahar. In 2008, suicide bombers attacked the Indian Embassy in the capital, Kabul, killing about 50 persons and wounding scores. There was another attack on the Indian Embassy in 2009. Prime Minister-elect Narendra Modi’s invitation to his Pakistani counterpart Nawaz Sharif for his swearing-in on Monday has put the entire Pakistani establishment in a fix. It is understood that while the Pakistan Foreign Office is in favour of Sharif travelling to Delhi for the oath-taking ceremony, the Army appears disclined. It is a known fact that Pakistan’s policy on India is decided by the all-powerful Army. Suspense continued throughout the day on whether Sharif would accept the invitation or ask President Mamnoon Hussain, his Adviser on Foreign Affairs Sartaj Aziz or his brother and Punjab province Chief Minister Shahbaz Sharif to attend the ceremony. Sharif personally is said to be in favour of the visit and meet Modi. An Indian official said one could understand Sharif’s dilemma. “If he skips the event, it will send negative signals to India and the world at large, but the acceptance of the invite could trigger a backlash from hardliners in Pakistan,” he said. Though the BJP’s victory in the elections was cautiously received in Pakistan because of the party’s hard-line position on issues concerning Pakistan, Islamabad’s official position has been that it would comprehensively and meaningfully engage with the Modi government. In Delhi, MEA spokesperson Syed Akbaruddin said while seven foreign leaders have confirmed their participation in the swearing-in ceremony, New Delhi was awaiting Islamabad’s response. Leaders from SAARC countries and the Prime Minister of Mauritius would grace the occasion. He indicated that Modi would hold informal talks with the visiting leader and host a banquet in their honour. “Short duration” bilateral meetings were scheduled for May 27, taking into account the departure schedule of the visiting leaders. The invitation to Sharif has sparked a debate in Pakistan. Hardliners like Hafiz Saeed of JUD said Modi had been provoking Hindus against Muslims and used provocative language against Pakistan. He warned Sharif against making hasty decisions that may harm the interests of Indian and Kashmiri Muslims and Pakistan’s larger strategic interests. But three major parties, the PPP, Pakistan Tehreek-i-Insaf (PTI) of Imran Khan and Maula Fazlur Rehman's JUI have welcomed the invitation and supported the view that the PM should respond positively. Former ambassador to New Delhi and Afghanistan Aziz Ahmed, while urging the PM to accept the invitation, said Modi had made a good gesture and created an opportunity for improving bilateral ties which must not be missed. He said a meeting with Modi would mean bilateral talks on a ceremonial occasion which would be free from the burden of formal talks. Sharif had called up Modi to congratulate him on his party’s election victory and invited him to visit Pakistan after assuming office. NEW DELHI: Pakistan Prime Minister Nawaz Sharif 's attendance at the swearing-in ceremony of his Indian counterpart Narendra Modi remained a matter of speculation on Friday as his office failed to take the final decision apparently under pressure from the army, which is the most powerful institution in the country and has a major say in its India policy. While Sharif and his ruling Pakistan Muslim League (Nawaz) are believed to be keen to reciprocate the gesture of the invitation extended to him, the final decision is expected only on Saturday, two days after his office indicated that he would attend the ceremony on May 26. Sharif is weighing all options before taking the final call, Pakistan government officials told ET. Tariq Azim, media advisor to Nawaz Sharif said in Islamabad on Friday, "The invitation is a bold and an unexpected move. Mr Sharif does not share the anxiety that is felt by some quarters here in Pakistan because he has got some very fond memories of the previous BJP Prime Minister Atal Bihari Vajpayee coming to Lahore and he hopes that this anxiety about Modi and his past will fade away." After his own election victory in 2013, Sharif had suggested that the Indian PM be invited to attend his inauguration ceremony, but Manmohan Singh had declined because Pakistan had failed to act on the accused of the Mumbai terror attacks and ceasefire violations along Line of Control continued unabated. Not only Sharif 's party but also the Pakistan Foreign Office recommended that the prime minister accept the invitation. 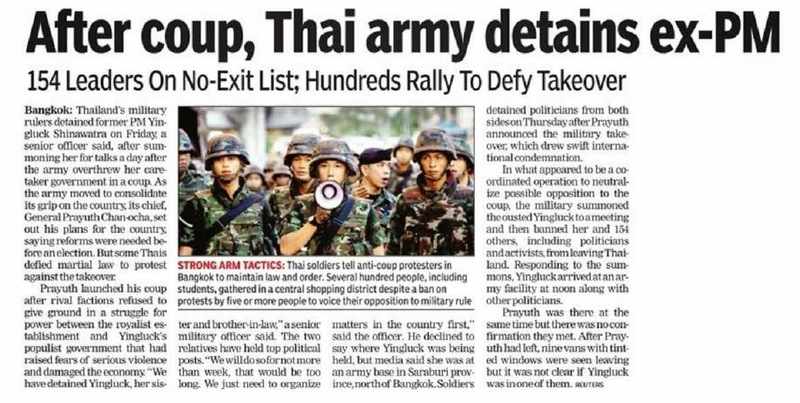 "The foreign office has made the recommendation and the decision will most likely be in favour. It will be a mistake to let this opportunity go. We need to see beyond today," a Pakistan foreign ministry official told Pakistan's English daily Dawn. Sharif had telephoned Modi to congratulate him on May 16, when election results were declared, and invited him to visit Pakistan after assuming office. Leader of Opposition in the Pakistan National Assembly Khurshid Ahmed Shah has also asked Sharif to accept the invitation. Meanwhile, Sri Lankan President Mahinda Rajapaksa, outgoing Afghan President Hamid Karzai, Bhutanese PM Tshering Tobgay, Nepal PM Sushil Koirala, Maldivian President Abdulla Yameen Abdul Gayoom are among SAARC leaders expected to attend a banquet organised by Modi after the swearing-in ceremony. With intelligence reports indicating pressure from Pakistan’s army and the Inter-Services Intelligence (ISI) on prime minister Nawaz Sharif against attending the swearing-in of Narendra Modi on May 26, security agencies have alerted the Indian Army and para-military forces over possible cross-border terror acts in Jammu and Kashmir. The Indian consulate in Herat, which has been attacked by suspected Lashkar-e-Toiba (LeT) terrorists, was already on high alert with reports of impending suicide attacks. The history of provocation from the Pakistani side on the eve of any dialogue to scuttle the talks was discussed on Thursday at a meeting, chaired by cabinet secretary Ajit Seth, with defence secretary RK Mathur seeking instructions in case of cross-border firing. While the directions were not to provoke any Pakistani action, it was amply clear at the meeting that the elements opposed to the India-Pak dialogue would like to put the Modi-Sharif meeting under pressure through terror actions on the LoC or in the hinterland. Immediately after the meeting, the Intelligence Bureau issued an alert from Jammu for the army and BSF to be on guard against any action by Pakistan’s army or the ‘jihadists’. While it is still not clear whether the Herat action is linked to Sharif’s India visit, the agencies are ruling nothing out as this eastern city of Afghanistan — where the Taliban’s writ does not run — is the territory of Shia warlord Ismail Khan. The PM-designate was briefed about the Pakistan situation by Intelligence Bureau’s former director Ajit Doval a day after an Indian soldier was killed and two injured in suspected militant firing across the LoC in Akhnoor on May 18. This incident came after two Pakistani infiltrators were killed carrying a claymore anti-personnel mine and two improvised devices in Poonch sector on May 10. One the infiltrators was wearing an unusual T-shirt, with “Shahadat is real life, al-jihad” written on it. 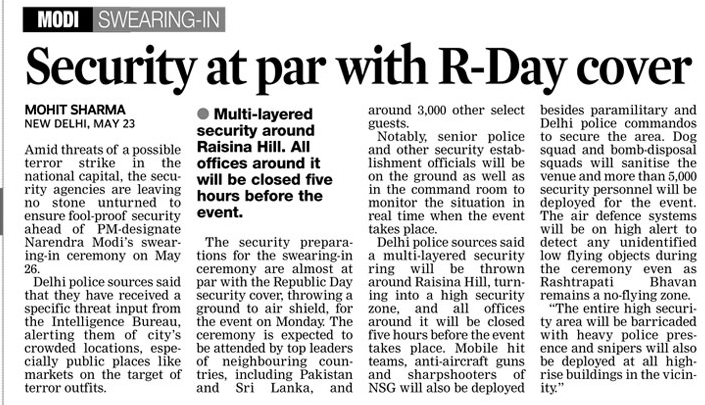 While the decision on Sharif’s visit is likely to be taken closer to May 26, the Indian security agencies are taking no chances given the violent reaction of ‘jihadists’ and Pakistan’s army to the India-Pak dialogue. 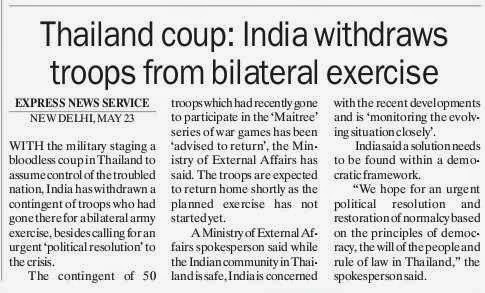 “Forces inimical to bilateral ties will try to ensure that the talks are scuttled,” said a senior home ministry official. Army Chief General Bikram Singh today visited south western Command Headquarters here, where he was briefed on the state of operational preparedness of the Command. He interacted with senior functionaries of the Command and addressed officers of the station on various issues, a defence spokesperson said. Emphasising on core values of honesty, truthfulness, sincerity, commitment and dedication, the Army Chief called upon all officers to instill greater pride in the service across rank and file. The Chief of Army Staff also emphasised on value-based leadership in accordance with the legacy of the Indian Army. A top Army officer today called on Jammu and Kashmir Chief Minister Omar Abdullah and dicussed the security situation in the state. "Lieutenant General Sanjiv Chachra, General Officer Commanding-in-Chief of Northern Command, called on Chief Minister Omar Abdullah and discussed the prevailing security situation and the measures being undertaken by Army towards sustained peace in the Valley," a defence spokesman said here. Lt Gen Chachra arrived here on a two-day visit to the forward areas falling under Srinagar-based Chinar Corps. He will also hold discussions on security situation with military and civil authorities. On his arrival, Lt Gen Chachra was received by Lieutenant General Gurmit Singh, Chinar Corps Commander, and briefed on the current operational situation on Line of Control and internal security environment prevailing in the hinterland. "The Army Commander lauded the efforts of Chinar Corps in providing environmental security during recently held elections. He also complimented 'Chinar Warriors' for their professionalism, steadfastness and dedication and wished them operational success in future," the spokesman said. Lt Gen Chachra would also be visiting the formations and troops deployed in the forward areas. 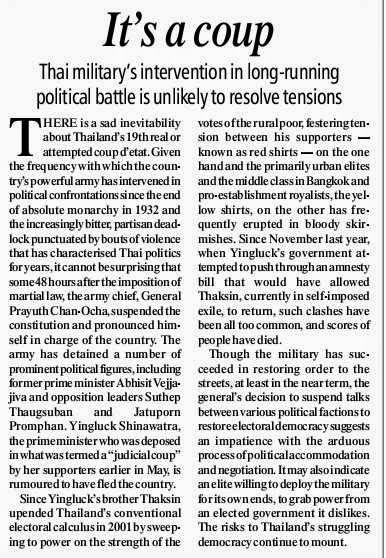 He is also scheduled to call on the Governor N N Vohra, the spokesman added.